Slimming World Diary: Productive Day? ..
Today was what I would like to call a 'productive one'. Sold a hell of a lot of old clothes on EBay over the week so it being the first business day after, I had to package, stamp and post them all. I have found it to be a really easy way of making money. Next I was putting a ham in to cook so I can have a nice ham salad in the week and some thick ham sandwiches, they are the best! I even tackled my ironing pile today, I was on a roll. Yes a very productive day indeed. 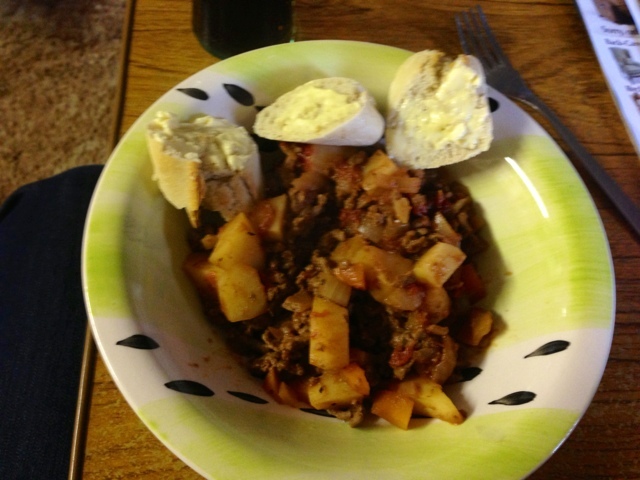 It was next onto dinner, minced beef hash with petit pan. This is what I like to call comfort food, it just so warm and delicious and is all made in one pot so it's easy to make and there isn't many pots to wash up after. 1. Spray a large lidded frying pan with Fry Light and place over a medium heat. Add the onions and stir-fry for 2-3 mins. 2. Add garlic and cumin, stirring for a few moments to release the flavours. 3. Add the minced beef and cook on high, stirring all the time and breaking up any lumps, until all the meat is sealed and brown. 4. Add the carrot, potatoes, tomatoes, stock and oregano and bring to the boil. Reduce the heat to medium and simmer, covered, for 12-15 mins. 5. Remove from heat, stir in parsley and season to taste before serving. You can add more veg to get more superfree in, or some green chilli to maybe give it an extra kick. I served it with a weight watchers petit pan and used it as my healthy B. This is a completely easy and syn free meal. After the gorgeous meal had settled it was off to do some laps at swimming to get my body magic in. I usually do 50 lengths but got sidetracked chatting so only managed 32. Got talking to Gemma (friend and fellow slimmer) about a great idea to freeze soup, so she gave me some to take home and try. She has her own great blog with more wonderful ideas and recipe Here. Go check her out! Tomorrow is weigh in day and also taster session, looking forward to it, I'll let you know how I got on.